Number of miles walked so far (boots on): 147. Number of days without snow since last blog: 1! Well I’m still here and ploughing on but I’ll be honest I’m not happy with myself. I’m not happy with my lack of #1000 miles, my general feeling of (un)fitness and my body for its current reactions to I wish I knew what. The long winter & central heating does not work well with eczema and sensitive skin so I dream of the sun on my skin in the not too distant future. Since my last blog I was determined to make a great effort and was full of motivation. As well as walking I attend 2 x circuit training classes, body balance and aqua aerobics each week and try to get to cross training, but not having much success on that one. I am trying to build up speed as I know I can walk a marathon. Last year I achieved the Dublin Marathon in 6hrs 57mins, so this is my PB I am desperate to beat. My only competition is myself. With all this in mind I have been focusing on my stamina. 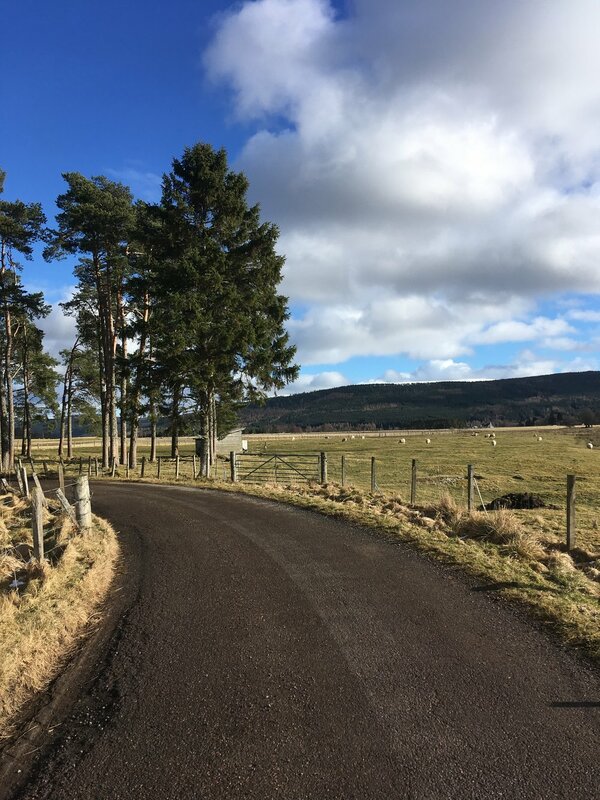 For me this means I climb hills – not a problem in the Cairngorm National Park Area. I have some amazing road walks which include hills. One weekend after circuits I set off round ‘the braes’. From my parents’ it’s 12 miles with 5 good hills of various lengths and steepness. I was very tired after that walk and not happy with the time it took me, but very happy to have achieved this walk early on in training. I will do this walk again a few times to test my speed in the hope of getting faster. 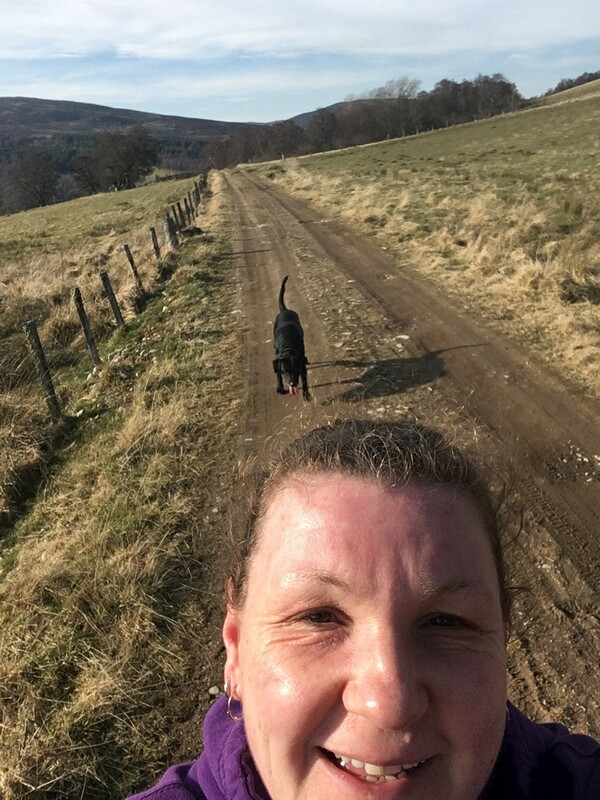 The following weekend we were blessed again with good weather so again after circuits, I borrowed my aunt’s dog and we walked 10 miles with 6 hills, 2 very steep ones as you ascend to the 2 viewpoints. Glad to say the dog was knackered before I was. I know most people have had snow over the last 2 weeks but most of you are now basking in 10- 15 degrees Celsius most days. We had snow, still have snow and the temperature didn’t get above 5 degrees Celsius with rain for last 2 weekends so I have to take to the treadmill again. Not my favourite type of exercise but I figure it’s better to work on speed than nothing at all. It's been cold where I live recently – really cold! Again my Walk the Walk family have given me support from afar even if it is to tell me how warm it is with them and how they are walking in t-shirts already. With the rubbish weather my motivation dips so I contacted a few of my lovely WTW family to plan weekends away. I have my 20 mile training walk sorted with my task master Anne Conrad down in Edinburgh. She’s planning this walk to be along the Edinburgh MoonWalk route so I can focus on a faster time. I’m guessing she will include Arthur’s Seat in this. So it’s been a mixed 4 weeks but I’m still here and we are almost at Spring. I am so excited to meet up with all my WTW family in London on 12th May for The MoonWalk London - my first of 5 challenges this year. This keeps me going. I’m loving reading all the posts on the #1000miles Facebook page. We can all motivate each other, whether you are a first timer or seasoned walker. Keep on walking folks and believe in yourself, one foot in front of the other and the rest will follow 👟. • Want to turbocharge your 1000 miles and have a night to remember forever? Sign up to do a a MoonWalk.